To call this vaguely bunny-like critter a gourmand is being kind. He's more of a glutton. Oh, he begins the day with a fairly humdrum and healthy diet. But after tucking away some chocolate doughnuts and fried eggs, this creature's appetite strays toward something crunchy--the furniture, maybe? He finds the chair and table a bit bland, however, and longs for something more... savory. To cool his palate the critter seeks some ice cream, but things only go from bad to worse! It's the animal that ate Albany! Nausea sets in after noshing on the napkin. Is he queasy? Is he sprinting for the potty? Well--yes! It's time for Dad to take over and try to soothe that upset tummy with tea and sympathy and saltines, plus hugs and kisses. All's well that ends well, with the day's dietary diary ending happily with Dad's little chowhound catching some ZZZZZs, in the noted Mo Willems' newest creation, A Busy Creature's Day Eating (Hyperion books, 2018). 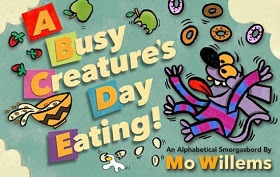 Subtitled "An Alphabetical Smorgasbord," the author-illustrator keeps his outrageous eater chomping alphabetically until "Z End" and after, with our little overeater creature chomping down the barcode, International Standard Book Number and Library of Congress numbers on the back of the dust jacket. Willems, who began as an ebullient Grammy-winning cartoonist for Sesame Street, lets this over-the-top guzzler run riot through his diet in a novel and extravagant style of cartooning. The only thing about Mo Willems' latest that is predictable are the giggles of gross-out glee from its young readers. Willem's Caldecott winners include Don't Let the Pigeon Drive the Bus! Knuffle Bunny: A Cautionary Tale, Knuffle Bunny Too: A Case of Mistaken Identity, and his Theodore Seuss Medals for beginning readers include five of his blockbuster Elephant and Piggie books. IN SUMMER TIME WE RISE AND SHINE! A BIG, BRIGHT SUN! LET'S HAVE SOME FUN! Sixteen little girls in slickers are ready for rain, but when the sun's out, it's time for swimming and splashing in swimsuits! And when leaves fall and autumn is all they've got, they make the best of it, skipping in the wild winds and jumping in the fallen leaves, picking apples from apple trees, and biking in the breezy breeze. Winter brings toboggan caps with tassels and poofy parkas and mittens, just right for snowballs and snowmen. And of course when spring zephyrs play with blossoms, when showers bring flowers, there are rainbows above. What's not to love about all sorts of weathers and seasons? Sixteen little girls, in two straight lines... in rain or shine.... If this book reminds us of something, it should, because it has the same premise as Ludwig Bemelman's Madeline. 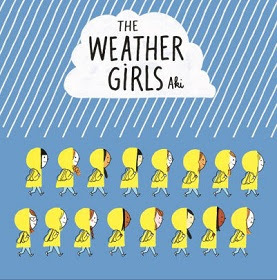 and Aki's brand-new The Weather Girls (Henry Holt and Company, 2018), while not giving us a picturesque tour of Paris, give us sixteen lively and varied little girls who are jolly and active whatever the weather. Cute as buttons in their sunny-colored slickers, they brighten a dreary rainy scene, and in all the seasons, they don't sit still, going hither and yon through the woods, the town, the seaside and the sledding hill, whither they willst through the seasons! Aki's straight lines of girls make for an engaging page design and this lighthearted look at the cycle of the seasons is a pleasure to the eye. Kirkus opines, "A breezy seasonal storytime choice . . . the art carries most of the weight—and does so delightfully." who tidied and cleaned and kept everything neat. But Pete is not satisfied by brushing Fox's fur or picking up twigs. In fact, Pete takes tidiness too far. He polishes birds' beaks and scrubs outcropping rocks. He clips off forest flowers that clash with each other's colors. When in the fall leaves begin to, er, fall, Pete scurries around, picking them up and putting them in proper trash receptacles, but when the piles of leaves threaten to get beyond daily pickups, Pete vacuums them up into piles of plastic trash bags. But then the bare trees look terrible! They've got to go, so Pete hires a backhoe. He digs them up. But now the animals that lived in, inside, and under the trees are homeless and bedraggled. The rain threatens to flood the forest floor, and no matter how well Pete wields his mop, the former forest is a muddy mess. What to do? Pete pops on his hardhat and brings in the heavy paving machines to cover the ground with concrete, a flooring that is easy to clean. No mud. No leaves.No mess. No trees. Hmmm! Pete's got nothing. He heads home but there's no door to his den. There's just... concrete! 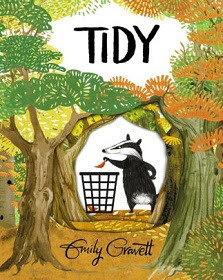 There's such a thing as too tidy, in Emily Gravett's thought-provoking Tidy (Simon and Schuster, 2017), as compulsive cleaner Pete learns to his sorrow. It looks like Pete's got a forest restoration project to keep him and his woodsy friends busy until spring. Gravett's story of a badger with OCD pokes fun at overdoing neatness, but also subtly suggests that when it comes to natural order, deferring to Mother Nature is the way to go. Gravett's rhymes are wry and telling, and her artistic skills are charmingly understated but skillfully thought out, with sly touches, as on the final page, with a hairbrush hidden behind his back, Pete still eyes Fox's gnarly tangled fur with that look in his eye. Of this one, Kirkus Reviews adds, "Alarming, timely, gorgeous, and open-ended, allowing readers the time to think for themselves." MARY HAD A LITTLE LAB. Mary loves her little lab, but she sometimes gets lonely there. Perhaps having a pet would help. But Mary doesn't go to the pet store. She's a scientist! SHE FOLLOWED HER TO SCHOOL ONE DAY. SHE LED THEM TO HER LITTLE LAB. The children are delighted as their sheep roll forth from the Sheepinator, but then there's a malfunction in Mary's mutton maker! The Sheepinator won't quit! In fact, it creates quite a glut of sheep! What shall Mary and her schoolmates do with all these shaggy pets with their fleecy pelts? 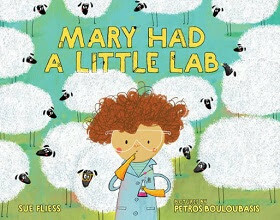 There are plenty of warm woolen sweaters in everyone's future, in Sue Fliess's funny fractured nursery rhyme, Mary Had a Little Lab (Albert Whitman, 2018). Author Fliess perfectly captures the cadence of the original rhyme scheme of "Mary Had A Little Lamb," and also borrows the age-old device of The Sorcerer's Apprentice in which the duplications just won't quit coming, while slyly putting in a plug for girls in science. Fliess's parody also succeeds with`the help of artist Petros Bouloubasis's soft and comical illustrations. "A rhyming picture book that would make even Dr. Seuss jealous...," says Shelf Awareness for Readers' reviewer. A mouse snoozes safely in his cozy mouse hole. But just outside that hole a dog is playing with his ball, which, (what are the odds?) bounces and rolls right through that mouse hole and lands in the lap of the no-longer snoozing, and now grumpy rodent. He kicks that ball back. The DOG is intrigued and poke his nose right into the mouse hole for an investigatory sniff. He put one EYE to the hole for a peep inside. Aha! He shoves a FOOT through the hole. GRRR! HELP! Mouse makes a run for it, right through Dog's legs, and Dog pursues the mouse through the kitchen and living room, where rugs scatter and a lamp falls. Now where is that miserable mouse? He seems to be Nowhere! OOPS! What's that sticking out from under the drapes? A mouse tail? Time for a pounce! 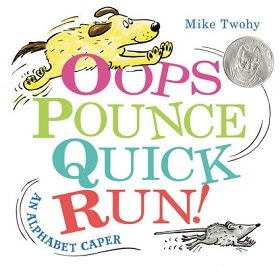 It's a classic chase, a la Tom and Jerry cartoons, in Mike Twohy's 2017 Theodor Seuss Geisel Award-winning Oops, Pounce, Quick, Run! : An Alphabet Caper (Balzer and Bray), except that this cat and mouse game is a dog and mouse game and it occurs, educationally, in alphabetical order. But just as Jerry is never in real danger from Tom, this mouse also makes the right move, wrapping up the dog's beloved ball in gift wrap, and concluding amiably, with a doggy tail wag, shared XOXOs, and some ZZZZzzzs as Mouse resumes his nap along with Dog. Author-illustrator Twohy's pen and marker artwork captures the rollicking frolic of the chase in true comic style, while youngsters get an unexpected romp through the alphabet as well. Good for tots just learning to recognize their letters and their sounds, and good for beginning readers who relish an amusing alphabet adventure in just twenty-six words, this one also has plenty of giggles built in for storytime. For read-alouds, pair this one with Mary Sullivan's equally enjoyable 2014 Geisel Award-winning Ball for a bouncy twofer read! With paper and pencil, I write and draw art to create my stories that come from my heart. But what if one day that pencil disappeared? I'd fold up the paper till stories appeared. No paper for origami? There is wood to be carved. No wood? There are found objects all around. Colored leaves and flowers can be shaped into designs or fantastic shapes--perhaps even a fire-breathing dragon! But what if there is no light to make the colors bloom? I would still have my voice! There are still stories to tell and songs to sing, and without a voice, there is still a world inside the mind to shape ideas--which is where it all begins in the first place. 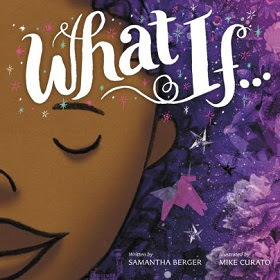 Samantha Berger's What If... (Little, Brown and Company, 2018) celebrates all the ways there are to create, set off with the gorgeous art of Mike Curato, whose abstract design and swirling colors illustrate the way people embellish their world with art, poetry, music, and story. Ancient pottery shards tell the same story. What did their makers have? Mud! How did they decorate their work? With thumbprints and fingernails! That they bothered to embellish a simple bowl tells us that the urge to create, to put our mark on our environment, to make a pot out of a puddle and a symphony out of silence is part of being human. That's just how we roll! Language arts, music and art teachers will love this book and use it to encourage students to make something--even out of nothing. After all, that's the fun of it! Says Publisher's Weekly, "Curato's collaged and found-object illustrations meet the creative challenges that (Berger's) text all but demands with moments of giddy inventiveness." Here are 14 young rebels (one just 6 years old, another only 13) who broke down walls to pursue their interests, talents, and rights. The world is a better place for all of us because they stepped out of the box. 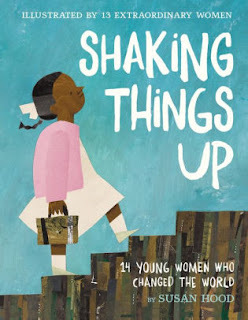 Susan Hood's Shaking Things Up: 14 Young Women Who Changed the World (Harper, 2018) offers fourteen poems about fourteen women and girls whose actions or lives really broke the mold. There is Ruby Bridges, a six-year-old African-American girl who alone walked through a jeering crowd into one of the previously segregated schools of New Orleans and thirteen-year-old Mary Anning, thrilled with the idea of prehistoric fossils beneath her very feet in London, who in 1812 discovered the first gigantic icthyosaur skeleton ever recovered. Mold-breaking young women were groundbreakers for their gender: Molly Williams, the young black cook for Oceanus Engine Company No. 11 in New York was the only one not sick with flu at the volunteer fire station when the alarm sounded, so she herself dragged the big pumping engine to the site of the fire and extinguished it herself, earning the lifelong title of Volunteer #11 and the only woman firefighter at Oceanus Company until 1982. In raging flames and choking smoke the brave Molly took the heat. With hose and axe, she met the blaze to save the house and street. There was Annette Kellerman, a dedicated nineteen-year-old swimmer who pioneered a sleek one-piece swimsuit for women. Arrested in 1919 for indecency at Revere Beach, Boston, Annette came up with the bold and streamlined swimwear which made it possible for Gertrude Ederle, sans soggy pantaloons, ruffles, and skirts, to become the first woman to swim the English Channel in 1926. Other path-finding young women featured include Frida Kahlo, the first Mexican artist to win a place at the Louvre, nineteen-year old Maya Lin, who won the architectural competition to design the Vietnam War Memorial, reporter Nelly Bly who won the Around the World in 80 days competition in 1890, and Malala Yousafzai, the youngest winner of the Nobel Peace Prize. Author Susan Hood offers varied poetical biographies and informational prose for each woman, and the book is illustrated in the unique styles of fourteen noted women artists such as Melissa Sweet, LeYuen Pham, and Sophie Blackall. This is a poetic feast for the eyes and an eye-opening look at how girls and women have overcome barriers to be the first and the best at what they accomplished to change the world. 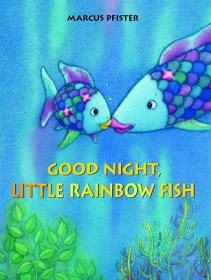 THE LITTLE RAINBOW FISH COULDN'T SLEEP. HIS EYES SIMPLY WOULD NOT CLOSE. Mother Rainbow Fish has put him in a comfy bed of soft plants, but Little Rainbow Fish doesn't like the dark. He's afraid to close his eyes. Mom has a bright idea. I'LL SEND FOR THE LANTERN FISH! The kindly lanternfish arrives to shine his little light in the dark sea floor. But Little Rainbow Fish still has some disturbing issues with going to sleep. He asks Mother Rainbow Fish to stay with him, and she promises she will stay close. But Little Rainbow Fish can't help worrying. What if the tide goes out and takes him with it? What if Octopus releases a cloud of ink, and he can't find his way back to his little bed? What if a jellyfish takes that opportunity to tie him up in his trailing tentacles? And then, what if he dozes off ... to sleep, perchance to dream? Even little fish can have bad dreams! But Mother Rainbow Fish just ties Jellyfish's tentacles in an attractive bow and wraps her fins around Little Rainbow Fish. Save and secure, he finally drifts off to sleep, in Marcus Pfister's sweet lullaby of a board book edition of Good Night, Little Rainbow Fish (NorthSouth Books, 2017 ed.). Author Marcus Pfister takes youngsters back to the time when the notoriously adventurous Rainbow Fish was a just a small insomniac minnow, fretting about the disturbing nighttime things that all youngsters worry about and needing reassurance that all is well before slipping gently into that good night. In this deep sea bedtime story, artist Phister's lovely signature illustrations are soft and soothing, done up with glowing greens and blues, accented with pinks and sparkles of gold.This little book is fine bedtime fare that also introduces a beloved picture book character to the very young. Mouse is psyched. She interrupts her friend Monster in standard mode, scarfing up a snack, with her big idea. "Let's go camping!" she said. "You walk in the woods. You sleep in a tent. You tell spooky stories." says Mouse. Camping sounds scary, but Mouse says she'll take care of Monster. She also promises something Monster will love--tasty camp-out treats! Monster is ready to go right away, but Mouse makes a simple list--tent, two sleeping bags, food, and a lantern lamp. Monster loads up his red wagon, and they are OFF! Mouse and Monster walk deep into the woods. Mouse hears the sound of a stream and offers to go ahead to reconnoiter. While Monster waits, he gets a little peckish. Mouse returns and the two campers trudge down the trail. Mouse offers to go ahead and scout for campground markers. Monster agrees to wait, but he soon gets the munchies and chows down on their sleeping bags. Following the trail markers, Mouse spies a hill ahead and offers to go up and check it out. Monster stays with the wagon, but while he waits, he wolfs down the tent. Mouse returns to announce she's found the perfect place to camp atop the hill. Let's set up the tent!" said Mouse. Monster has to 'fess up that he's eaten the sleeping bags and the tents. He's so sorry. Mouse magnanimously says not to fret. It'll be fun to sleep on the grass under the stars, she says. Hand me the lamp so I can find our food." Ooops! Monster assures Mouse that the one thing he did not eat was their food. But this time it's Mouse's turn to confess a mea culpa. "I forgot the food." she admits. "But then," Dad was saying, dramatically, "a terrifying monster came...."
All's well that ends well, as Monster appears the flickering firelight and the human family makes a hasty escape in their SUV. 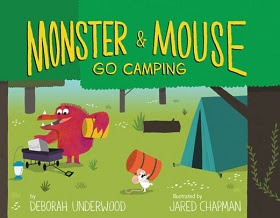 It would be a shame to let that cozy campsite go to waste, so Mouse and Monster have a classic campout after all, in Deborah Underwood's charming new picture book, Monster and Mouse Go Camping (Houghton Mifflin Harcourt, 2018). Mouse and Monster are the usual odd couple of unlikely buddies in a clever story in which Underwood drolly sets up a denouement in which Monster's sudden appearance clears the campsite in a trice. Underwood's delightfully daffy story is ably assisted by noted artist Jared Chapman, whose cartoon illustrations in comic color and line tell the story with stylish visual humor. Underwood is the seasoned author of many popular picture books, including The Quiet Book and sequels, and Here Comes the Easter Cat and sequels (see reviews here), and Jared Chapman is the noted illustrator of Steve, Raised by Wolves Vegetables in Underwear and Veggies with Wedgies (read reviews here). The weather is warm and sunny and the pool is at last open. Spot and Mom are off for a dip, and Spot's friend Tom Gator and his mother are there already. Tom waves to invite Spot to join him. But Spot hesitates. THE WATER IS LOOKING A BIT COOL, AND SPOT IS FEELING A LITTLE UNSURE. But his buddies Tom and Steve the others are giggling and kicking, and floating around, and it looks like so much fun that Spot decides to take the plunge with his polka-dotted floatie. And the water is FINE! Eric Hill's new Spot Goes to the Swimming Pool (Frederick Warne, 2018) is out, just in time for pool openings all over. It's natural for little ones to be a bit intimidated by the busy pool setting, but it's almost sure that they'll learn that being in the swim is just another way to have fun in the sun. 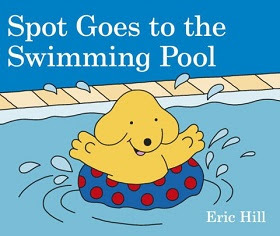 In Hill's charming illustrations, Spot is a great stand-in for introducing preschoolers to new experiences, and getting them on the way to learning to swim is an important skill and a new way to play with their friends. For more water play, pair this one with Eric Hill's Spot Goes to the Beach, complete with lift-the-flap discoveries for young would-be beachcombers. Charlotte was not one of those little girls who dote on dollies and tea sets. Charlotte's head was always in the clouds. No, not those fluffy clouds in blue skies. Charlotte's favorite clouds are the data-storage sort. Charlotte is a techno-cyber-whiz who prefers downloads to dolls, coding to cuddling plush critters, and virtual reality goggles to giggly tea parties. Even her little dog is named Blutooth. Mom doesn't know where Charlotte got her consuming interest in IT, but she is happy for her help with all their internet-enabled devices. Still, Mom feels that Charlotte needs more experience interacting with actual reality--so she gets her a doll and doll stroller to play with. "Are there instructions?" asked Charlotte. "I was thinking you could play house or doctor with it," said Mom. But no matter what commands Charlotte gives her, Doll-E just sits there with the same silly smile on her face. But when Charlotte puts the doll down, it speaks. "I'm not your MAMA!" Charlotte says. Investigating the source of the voice, Charlotte discovers something she recognizes--a panel in the doll's back with batteries and wiring inside. At last! Here's something she can hack! Charlotte's brain goes into hyperdrive. "I know! I could run an update on you! It's going to be awesome!" Charlotte works on her program all night and at last Doll-E is ready for the installation. "HELLO. MY NAME IS DOLL-E 1.0!" 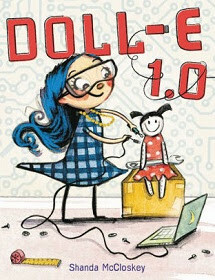 And with Charlotte with the controller and Doll-E fitted with the proper electrodes in her helmet, the two are ready to walk the dog outside, with Doll-E pulled in her stroller by Blutooth, in Shanda McCloskey's brand-new debut picture book, Doll-E 1.0 (Little, Brown, 2018). Charlotte is an engaging little girl techno-geek, resourceful and inventive, drolly portrayed by first-time author-illustrator Shanda McCloskey, who appropriately combines her comic pencil and watercolor drawings with Photoshop digital artistry in the creation of the her little technical wizard and her new, updated techie toy. 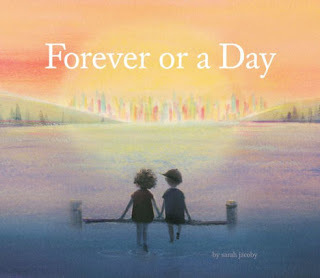 Says School Library Journal, " McCloskey's picture book debut is not one to miss. A fun addition." At least that's what Thelma the Pony thinks. You see, she wished with all her heart to be a unicorn. Although Otis the Mule thinks the stocky little pony is perfect just the way she is, Thelma has bigger dreams. And one day it happened. A carrot on the ground. She tied it to her nose. And without the wave of a fairy wand or a single bibbidy boppidy boo, Thelma is transformed. Upon her head is a spiraling, sparkly horn, her coat is pink, and her tail is long and silvery. She is a beautiful UNICORN. Thelma The Unicorn tours the world, making appearances before her adoring public, sailing the seven seas on her cruise ship, The Fairy Princess. Throngs await her at every port, swooning at her beauty and begging for her sparkly autograph. Fans await her everywhere, from early morn till midnight. It's great! Thelma realizes that it's all a bit too much. So much fame was kinda tricky, too. You see, her fans were mad for her. They'd chase her everywhere she went. Thelma realizes that there's no escape from her fame. She's no longer herself; it's like her admirers own her! They are her FANS, so they feel entitled to follow her every move. One dark night, she felt quite sad, this famous little pony. She said, "I thought that I'd feel great..., but all I feel is lonely." Heavy lies the head that wears the horn. Thelma finds it lonely at the top. There's only thing to do, and Thelma does it. Off comes the magic carrot, and Thelma the glamorous unicorn is no more. It's back to being an ordinary pudgy pony with good ol' Otis waiting to keep her company, in Aaron Blabey's little picture book parable of ditching the Disney delusion of fame, Thelma the Unicorn (Scholastic Press, 2018). Like Blabey's popular character Pig The Pug, Thelma longs for fame, but finds it folly, with artist Blabey providing a plenty of comic scenes along the way as Thelma flees her fans and returns to savor the simple life. 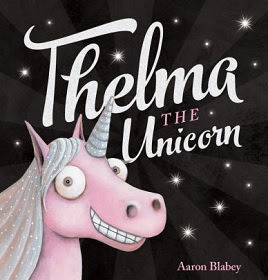 Unlike the hopelessly self-absorbed Pig the Pug, though, Thelma emerges a reformed and more lovable character, and with her big smile and googly eyes intact, Thelma returns to her roots as artist Blabey's lovable illustrations poke fun at the glow of the glitterati. Blabey's other books are Pig the Pug, Pig the Winner (Pig the Pug), Pig the Star (Pig the Pug), Pig the Fibber, and Pig the Elf (Pig the Pug). (See reviews here). Fruit Basket Turn Over! Mrs. Peanuckle's Alphabet by Jessie Ford. Bet you thought I 'd say APPLE! But both are fruits and both grow on trees. Fruits can grow on vines, on bushes, and on trees. BANANAS and COCONUTS both grow on trees, but one is long and a little soft, and the the other is round and veryhard. RASPBERRIES grow on bushes, but GRAPES grow on vines, and both are soft and juicy when they are ripe. FIGS, fresh and delicious. Dried and nutritious. 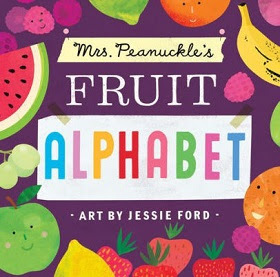 From as exotic as JACKFRUIT or XIGUA, or as common as ORANGES and APPLES in the lunchbox, fruits are great foods for everyone, and Jessie Ford's Mrs. Peanuckle's Fruit Alphabet (Mrs. Peanuckle's Alphabet Library) (Macmillan, 2017) offers practice with the alphabet and a chance to get to know a wide variety of fruits, including TOMATOES, that very versatile fruit which often passes for a vegetable. Okay, it's not so sweet as most berries but essential for a savory sauce for spaghetti and pizza or to top a hamburger or hot dog. For young abecedarians and young foodies alike, this little book does double duty, tempting youngsters to try a walk through the produce section to make up their own alphabet book of fruits. And, yes!APPLES count! Sheep 101 fails to clear the rails. #102 barely makes it over sheep and railings. Sheesh! Night shifts stink! "We've got a sheep down!" shouts the dispatcher. While Sheep 101 is carted off by the Sheep EMR team, a substitute reports for duty. "Yeah, they ran out of sheep, so they called me. I usually jump over the moon, so this fence should be a breeze! The rest of the sheep must have signed on with Little Bo Peep for the day shift, because a motley crew of fleeceless critters appear one at a time to take a crack at the fence--PIG, singing WEE WEE WEE, a BLIND MOUSE who can't even find the fence, and who's this? HUMPTY DUMPTY?? Gimme a, er, break! 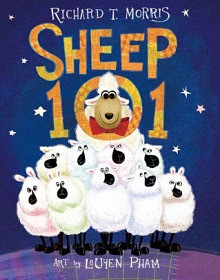 There's no rest for the sleepless in Robert Morris's sleepytime tale, Sheep 101 (Little, Brown and Company, 2018), with witty dialog by author Morris and comic illustrations by Leuyen Pham that fairly pelt the reader with the sight gags until sweet dreams set in. A wild and woolly fractured folk tale of a story, this one will send kids to sleep with a smile on their faces. As Publishers Weekly puts it, "It's practically guaranteed that readers will go giggling into that good night!" Scientist, scientist, what do you see? I see Marie Curie in her laboratory. That's the easily-recognized image of Albert Einstein, pointing out his famous contemporary Marie Curie with her iconic beaker. 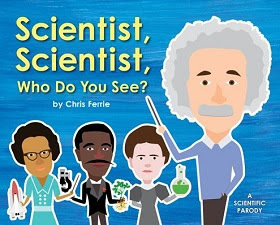 and in Chris Ferrie's new board book for precocious tots, Scientist, Scientist, Who Do You See? (Sourcebooks/Jabberwocky, 2018), there are plenty of pairs of notables from science and technology. Chemist Ahard Zewail introduces Grace Hopper, Navy admiral and builder of early computers. Early wizard of electromagnetic energy, James Maxwell, introduces his own contemporary Ada Lovelace, Victorian mathemetician and creator of the calculator codes that led to twentieth century computers. Maxwell, Maxwell, who do you see? I see Ada Lovelace, making computer enquiry. There are more scientists along the way, Allan Turing, co-cracker of the Nazi Enigma encoding machine, and Chien Shiung Wu, George Washington Carver, Anna Mani, and Katherine Johnson are also introduced. This book is one of the recent flurry of early childhood books presenting personalities and information about complex scientific subjects, such as Ferrie's earlier ABCs of Science (Baby University) Although little listeners will need to fill in their live's work in later reading, this newest by Ferrie gives youngsters a chance to meet a variety of scientists, male and female, from all over the globe. Properly appreciating this little book presupposes some previous experience with Martin and Carle's perennial best seller, Brown Bear, Brown Bear, What Do You See? but even lacking that, the rhythmic question-and-answer format moves this list of science stars along splendidly. And even if preschoolers don't quite pick up on this artful parody, grownups reading these books aloud certainly will, especially if they've also read Ferrie's Goodnight Lab: A Scientific Parody (Baby University, Ferrie's earlier parody of Margaret Wise Brown's eternally best-selling Goodnight Moon. It's all in good fun for early childhood education, and that's got to be a good thing! It can be precise, like pouring the first cup of tea or picking out the first shoe. It's a drum beat. Ba dum Ba dum Ba dum Ba dum. It can come and go and you never notice it's there. Where did it go? We can't see it or hold it, but we know when it comes and goes. We're stuck in it, but never in the same place in it. It can hang heavy on our hands, but it sometimes slips away. Yes, it's TIME, in Sarah Jacoby's new book, Forever or a Day (Chronicle Books, 2018), which teases the reader a bit about its subject, but slyly shows its hand on the frontispiece, which shows a newspaper delivery van whose side reads TIMES. In a child's-eye-view of times passing, we see a bus stop with time-pressed passengers checking their watches, an airline time table with flights ON TIME or LATE, and we see good times on vacation where the kids long to go back in time for a do-over. It's a question to which there is only one honest answer. We've only got what we've got. There are good times and bad times, but the best times are those shared with those we love best. Artist Jacoby shows close-ups of intimate times or lovely panoramas of sea, sky, and land done in a wash of watercolored images, some clear, some slightly out of focus like time remembered. This is beautiful and thoughtful book that introduces to young children the concept of time as something that both can and can't be measured by a clock, something of which we are usually no more aware than the fish is aware he is in water. Even Einstein found it a good thing to think about, and when you have the time, this is a good book to share. 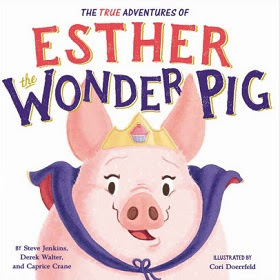 Esther was a little piglet. She was rescued when she was six weeks old and arrived in a laundry basket. She looked up at her dads with those eyes and that smile. She was the littlest pet when she came to live in a small apartment that already had two dogs and two cats. But Esther was a good eater, and soon graduated from her basket to a cat bed. But she continued to grow--from cat beds to progressively bigger and bigger dog beds. "We thought she was supposed to be a mini-pig!" they said. But when she looked up at the with those eyes and that smile, it was LOVE! Esther ate everything she could find. She even broke the oven door--perhaps looking for dessert! When they looked at those eyes and that smile... it was LOVE. Esther was part of the family, and families come in all shapes and sizes!